Total # of books: 148645. Max. 5000 are shown. 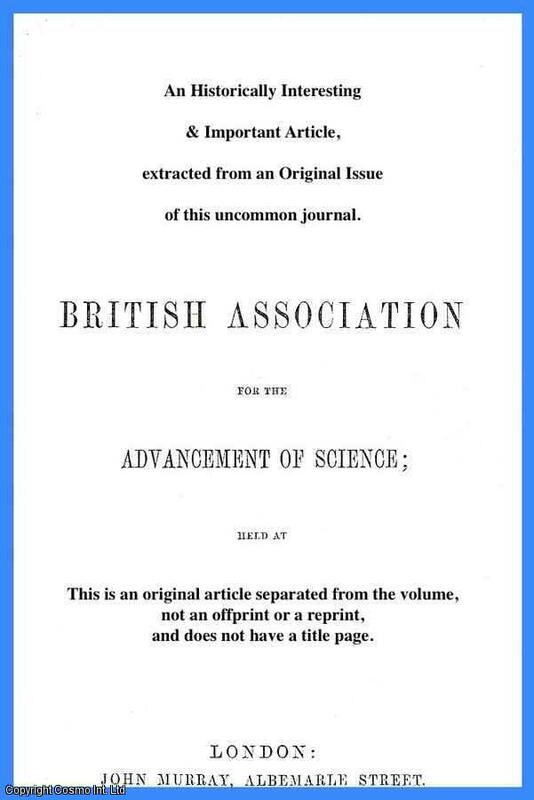 Report of the British Association for the Advancement of Science. 1949. First Edition, Disbound. Very Good. 5 pages. Note; this is an original article separated from the volume, not a reprint or copy. Size: Octavo (standard book size). Quantity Available: 1. Category: British Association for the Advancement of Science; Inventory No: 225100. Report of the British Association for the Advancement of Science. 1958. First Edition, Disbound. Very Good. 9 pages. Note; this is an original article separated from the volume, not a reprint or copy. Size: Octavo (standard book size). Quantity Available: 1. Category: British Association for the Advancement of Science; Inventory No: 225645. Report of the British Association for the Advancement of Science. 1953. First Edition, Disbound. Very Good. 18 pages. Note; this is an original article separated from the volume, not a reprint or copy. Size: Octavo (standard book size). Quantity Available: 1. Category: British Association for the Advancement of Science; Inventory No: 225353. Report of the British Association for the Advancement of Science. 1953. First Edition, Disbound. Very Good. 18 pages. Note; this is an original article separated from the volume, not a reprint or copy. Size: Octavo (standard book size). Quantity Available: 1. Category: British Association for the Advancement of Science; Inventory No: 225364. Report of the British Association for the Advancement of Science, 89th. Meeting, Edinburgh, 1921. 1921. First Edition, Disbound. Very Good Condition. Octavo. 5 pages. Note; this is an original article separated from the volume, not a reprint or copy. Quantity Available: 1. Category: British Association for the Advancement of Science; Inventory No: 148810. Report of the British Association for the Advancement of Science, 89th. Meeting, Edinburgh, 1921. 1921. First Edition, Disbound. Very Good Condition. Octavo. 7 pages. Note; this is an original article separated from the volume, not a reprint or copy. Quantity Available: 1. Category: British Association for the Advancement of Science; Inventory No: 148811. Report of the British Association for the Advancement of Science, Annual Meeting, Aberdeen, 1934. 1934. First Edition, Disbound. Very Good Condition. Octavo. 5 pages. Note; this is an original article separated from the volume, not a reprint or copy. Quantity Available: 1. Category: British Association for the Advancement of Science; Inventory No: 150793. Report of the British Association for the Advancement of Science, 58th. Meeting, Bath, 1888. 1888. First Edition, Disbound. Very Good Condition. Octavo. 6 pages. Note; this is an original article separated from the volume, not a reprint or copy. Quantity Available: 1. Category: British Association for the Advancement of Science; Inventory No: 150950. Report of the British Association for the Advancement of Science, 85th. Meeting, Manchester, 1915. 1915. First Edition, Disbound. Very Good Condition. Octavo. 80 pages, textual figures. Note; this is an original article separated from the volume, not a reprint or copy. Quantity Available: 1. Category: British Association for the Advancement of Science; Inventory No: 183002. Report of the British Association for the Advancement of Science, 58th. Meeting, Bath, 1888. 1888. First Edition, Disbound. Very Good Condition. Octavo. 6 pages. Note; this is an original article separated from the volume, not a reprint or copy. Quantity Available: 1. Category: British Association for the Advancement of Science; Inventory No: 212243. Report of the British Association for the Advancement of Science, 85th. Meeting, Manchester, 1915. 1915. First Edition, Disbound. Very Good Condition. Octavo. 80 pages, textual figures. Note; this is an original article separated from the volume, not a reprint or copy. Quantity Available: 1. Category: British Association for the Advancement of Science; Inventory No: 214805. Report of the British Association for the Advancement of Science, 85th. Meeting, Manchester, 1915. 1915. First Edition, Disbound. Very Good Condition. Octavo. 80 pages, textual figures. Note; this is an original article separated from the volume, not a reprint or copy. Quantity Available: 1. Category: British Association for the Advancement of Science; Inventory No: 214806. Report of the British Association for the Advancement of Science, 89th. Meeting, Edinburgh, 1921. 1921. First Edition, Disbound. Very Good Condition. Octavo. 5 pages. Note; this is an original article separated from the volume, not a reprint or copy. Quantity Available: 1. Category: British Association for the Advancement of Science; Inventory No: 214894. Report of the British Association for the Advancement of Science, Annual Meeting, Aberdeen, 1934. 1934. First Edition, Disbound. Very Good Condition. Octavo. 5 pages. Note; this is an original article separated from the volume, not a reprint or copy. Quantity Available: 1. Category: British Association for the Advancement of Science; Inventory No: 215096. Report of the British Association for the Advancement of Science, 85th. Meeting, Manchester, 1915. 1915. First Edition, Disbound. Very Good Condition. Octavo. 80 pages, textual figures. Note; this is an original article separated from the volume, not a reprint or copy. Size: Octavo (standard book size). Quantity Available: 1. Category: British Association for the Advancement of Science; Inventory No: 221359. Report of the British Association for the Advancement of Science, 74th. Meeting, Cambridge, 1904. 1904. First Edition, Disbound. Very Good Condition. Octavo. 4 pages. Note; this is an original article separated from the volume, not a reprint or copy. Quantity Available: 1. Category: British Association for the Advancement of Science; Inventory No: 150009. Report of the British Association for the Advancement of Science, 74th. Meeting, Cambridge, 1904. 1904. First Edition, Disbound. Very Good Condition. Octavo. 4 pages. Note; this is an original article separated from the volume, not a reprint or copy. Quantity Available: 1. Category: British Association for the Advancement of Science; Inventory No: 214068. Report of the British Association for the Advancement of Science, 74th. Meeting, Cambridge, 1904. 1904. First Edition, Disbound. Very Good Condition. Octavo. 4 pages. Note; this is an original article separated from the volume, not a reprint or copy. Size: Octavo (standard book size). Quantity Available: 1. Category: British Association for the Advancement of Science; Inventory No: 221142. Report of the British Association for the Advancement of Science. 1949. First Edition, Disbound. Very Good. 14 pages. Note; this is an original article separated from the volume, not a reprint or copy. Size: Octavo (standard book size). Quantity Available: 1. Category: British Association for the Advancement of Science; Inventory No: 225102. Report of the British Association for the Advancement of Science. 1949. First Edition, Disbound. Very Good. 2 pages. Note; this is an original article separated from the volume, not a reprint or copy. Size: Octavo (standard book size). Quantity Available: 1. Category: British Association for the Advancement of Science; Inventory No: 225080. Report of the British Association for the Advancement of Science. 1946. First Edition, Disbound. Very Good. 7 pages. Note; this is an original article separated from the volume, not a reprint or copy. Size: Octavo (standard book size). Quantity Available: 1. Category: British Association for the Advancement of Science; Inventory No: 225017. Report of the British Association for the Advancement of Science. 1957. First Edition, Disbound. Very Good. 7 pages. Note; this is an original article separated from the volume, not a reprint or copy. Size: Octavo (standard book size). Quantity Available: 1. Category: British Association for the Advancement of Science; Inventory No: 225592. Report of the British Association for the Advancement of Science. 1957. First Edition, Disbound. Very Good. 2 pages. Note; this is an original article separated from the volume, not a reprint or copy. Size: Octavo (standard book size). Quantity Available: 1. Category: British Association for the Advancement of Science; Inventory No: 225598. Report of the British Association for the Advancement of Science. 1940. First Edition, Disbound. Very Good. 52 pages. Note; this is an original article separated from the volume, not a reprint or copy. Size: Octavo (standard book size). Quantity Available: 1. Category: British Association for the Advancement of Science; Inventory No: 224960. Report of the British Association for the Advancement of Science, 58th. Meeting, Bath, 1888. 1888. First Edition, Disbound. Very Good Condition. Octavo. 25 pages. Note; this is an original article separated from the volume, not a reprint or copy. Quantity Available: 1. Category: British Association for the Advancement of Science; Inventory No: 150938.